Information presented here has been provided by the manufacturer. The Middle Horn Leader does not intend to offer opinions regarding this mouthpiece. Reprinted from manufacturer's Web Site: IYM Corp. is pleased to introduce this distinctive Larry Kerchner Mellophone mouthpiece which incorporates the specifications of the renowned Grammy-nominated arranger/composer/ lyricist/musician. This mellophone mouthpiece is unique in look and feel. The mellophone mouthpiece now is specifically designed for the marching mellophone. But, as you will discover, form follows function. The heavy mass design of the mellophone mouthpiece contributes to effortless playing. It incorporates elements which produce a dark, rich, orchestral French Horn timbre with comfort and stability. The mellophone mouthpiece has excellent range and articulation allowing for accurate not placement while maintaining a centered pitch in all registers. Made in the USA using the latest high-tech equipment to assure quality control. Model M-1 standard model, fits all except King horns. Model M-2 stem designed to fit King horns. Please specify desired model when ordering. Two heavyweight mouthpiece models with specialized backbores are available from IYM. 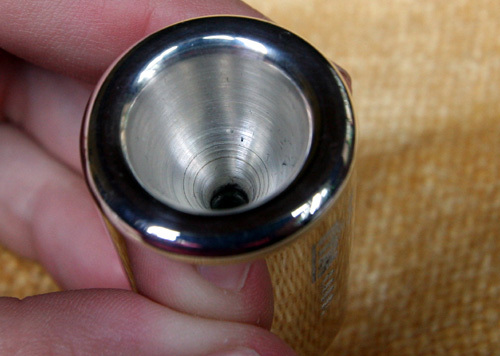 IYM mouthpieces are plated with 2 to 4 times more silver than used by others companies. This means that you get a higher quality product with a surface which will last longer. When thin plating wears off, it exposes the player to the base metal which is not recommended as a playing surface. Better plating will provide a smoother surface for a longer time and greatly reduce re-plating costs and the inconvenience of being without your mouthpiece for any length of time. My company had just re-introduced the Rudy Muck mouthpieces for trumpet and tenor trombone and went to a rehearsal of the Caballeros Alumni. We showed Larry [Kerchner] who, knowing me from my time with the Caballeros while he was the arranger and I also was the section leader, began to complain about the intonation problems of the mellophone. That discussion led to further discussions to identify the problem for study. My company felt that the solution had to be in the mass of the mouthpiece since we were not capable of altering the horn's tooling or getting any manufacturer to make any such very expensive redesign. 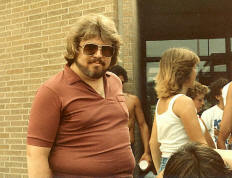 Larry Kerchner during his time with the Bayonne Bridgemen drum and bugle corps. When we met again with Larry, we presented our design and explained that the heavy mass would act to reduce the unwanted vibrations present with all other lightweight mouthpieces in use. We also altered the length of the mouthpiece because the sharpness of the horn did not benefit from any unnecessary length which would only accent the inherent sharpness. One side benefit would be that the heavy piece would tilt the balance of the horn from its heavy front end toward the playing end, which it did very well. 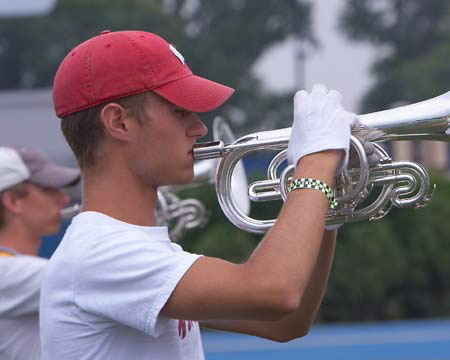 This alone has resulted in far fewer hand and wrist injuries to mello players this year as reported by corps and their ortho doctors. We stayed away from the trumpet cup because it did not suit the horn or register. Larry was not a fan of heavy mass mouthpieces and did not like this proposal. We were convinced about it and proceeded to have a prototype made at the company's sole expense for testing. If Larry didn't like the result, he did not need to have further involvement and we would not put his name on it. The prototype was a success. We developed a simple exercise for demo purposes which had a player play "G" (or "C") for sustained tone of 4 to 8 counts on and above the staff with the new mouthpiece. Then, repeat that same exercise on whatever they normally played. The difference was immediately noticeable which showed that the other mouthpiece made the horn sharp. It is interesting to note that mello players had become so used to the sharpness of the pitch that their initial reaction was that the new mouthpiece "was flat" until we pointed out that they were now in tune. The silky mid-range was easy to master; the upper range took some more focus but by using our simple exercise and proper brass technique, players could easily attain upper register accuracy, placement and accurate pitch. We achieved the French horn sound that eluded arrangers and manufacturers for 30 years. 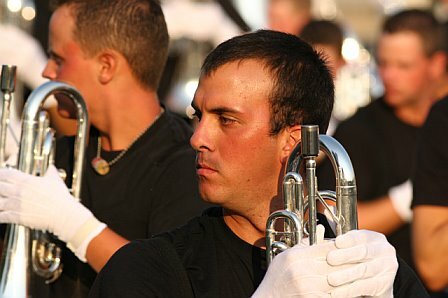 Up until this point, even Larry who was known as "Mellophone Larry" as the horn's biggest proponent, had not been able to attack and solve the intonation problem. My extensive recording background led me to conclude that, like recording, the use of the proper tool at the origin of the chain was extremely critical to shaping what came out at the other end. That's why selection of the proper microphone is critical in recording. That was the analysis that led us to alter the origin in the chain - the mouthpiece. Since one horn sounded great, the entire section had to sound even greater on this mouthpiece. We entered production and made that happen. The true function of the mellophone as the glue in any arrangement holding upper and lower voices together could now be achieved. This was still winter and the only horn lines operating were alumni corps. We visited them and did demos and they all got it and began to install them in full sections. One of the first was the Bridgemen Alumni. From there, it was a matter of going further and The Cavaliers immediately recognized the situation and the rest is history. That pretty much covers Larry's involvement. While Larry was in Blue Rock, he was a French horn player. As soon as the mello came out after Stan Kenton pioneered it, Larry fell in love with the horn and was notorious for throwing out the French horns of every group he taught and installing mellos. Ultimately, the horn, because of its severe flaws, was only used in limited ways and eventually in what became speed playing to achieve only a passing part of the particular chord. This new mouthpiece made the horn sound like a French horn, playing in tune in all registers, accurately and with desired timbre. The Cavaliers demonstrated this repeatedly in their '05 show highlighting the entire section on those ladders at the front sideline where no one could miss it. They were suspected of using French horns! 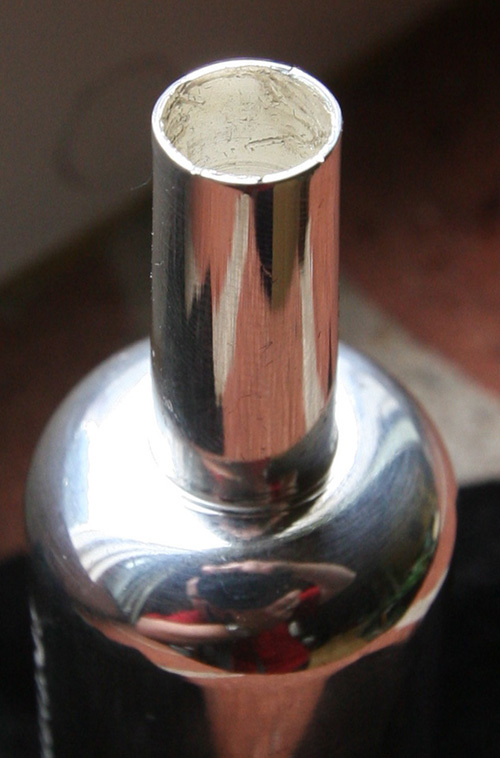 The Kerchner Mellophone M-1 Mouthpiece features a deep v-cup and relatively wide cup diameter. Some unanticipated deep tool marks and defects on the end of the backbore of this new Kerchner M-1 were encountered. IYM Corp Web Site (click here). IYM Order Form (click here).